Artist Tuan Andrew Nguyen; Eungie Joo, curator of contemporary art at the San Francisco Museum of Modern Art; and artist Wu Tsang. The second day of March Meeting 2018 revolved around image-making in film and video formats, and involved discussions of both the distribution of these works as well as the specific visuals within them that can convey or relate to the conditions of a place or society. An all-female panel, moderated by artist Maha Maamoun, introduced the Sunday, setting the tone with meditations on audience, permission and opacity. There was an air of defiant resistance: against normative expectations of glossy blockbuster images, as in the low-resolution, Nokia-shot films produced by Tentative Collective; or in the existence of spaces like the Metropolis Art Cinema, the only one of its kind in Lebanon. Paragraphs could be written about each speaker’s organizations and their holistic purposes and missions, which were disparate but intersected. Butheina Kazim spoke of independant platform Cinema Akil’s desire to build a brick-and-mortar space—a goal the organization has had since its inception in 2014, soon to be realized in June of this year in one of Alserkal Avenue’s raw warehouse spaces in Dubai. In contrast was Vdrome, an online-only film platform co-curated by Filipa Ramos, who discussed the idea of ephemerality in screenings, bridging that with the idea of the screen as a space of accumulation and the invisible deposits of history contained within such a space. Hania Mroué, of Beirut’s Metropolis Art Cinema, relayed a story of persistence in continuing to screen films, organize workshops and spread knowledge for an audience who would otherwise have little or no access to this culture. On the other hand, Yaminay Chaudhri made explicit her intent to deliberately restrict screenings and engagements to specific communities in and around Karachi, in order to create an intimate environment of filmmaking under the banner of Tentative Collective. However, she mentioned that accesibility is still a concern for the group, not in the conventional sense of growing a mass audience, but in providing and organizing situations, such as: public screenings on buildings, as an inversion of the closed spaces within the walls; or arranging thrice-weekly meetings within a respected or well-known figure’s house for community members to gather and discuss filmmaking. Engaging and relevant, the panel was well-structured and provided natural opportunities for dialogue between the speakers and the audience. Unfortunately, it was also overlength, cramping the other events’ timeframes and resulting in a back-to-back schedule that allowed little time to breathe in between sessions, let alone mingle and talk to the participants—as such, the “meeting” aspect of March Meeting seemed to have disappeared. In the very brief presentation that followed, Mohammad Ali Atassi, director of the organization Biddayat, which produces, supports and promotes films from Syria, reminded us that, in the midst of conflict, it is in the image, or the lack of image, that we see people and their stories. Manthia Diawara and Salah Hassan’s talk came next. Hassan, who is a professor at the Institute for Comparative Modernities at Cornell University, began by demonstrating the history of Arab and African solidarity, tracing the roots of this back to the 1960s, from Nelson Mandala’s visits to Algeria and Malcom X’s trip to Egypt, to the current parellels between the Black Lives Matter movement and the cause for rights of Palestinian citizens. He suggested that the acts of solidarity seen in the 1960s needed to be mobilized once more, particularly now when we seem to be returning to colonized environments (seen in places such as Syria), before handing the conversation over to Diawara, an artist, writer and filmmaker. 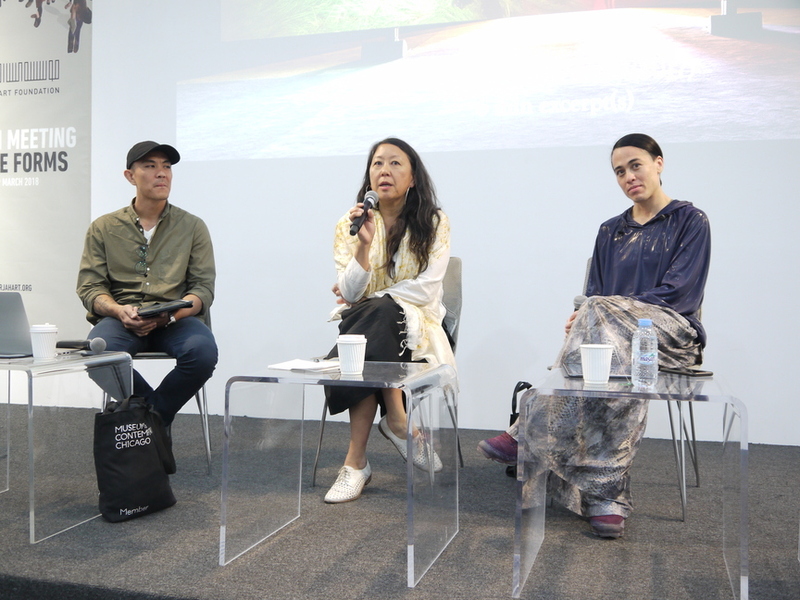 Then, Eungie Joo, San Francisco Museum of Modern Art’s curator, hopped onto stage with two old friends—artists Tuan Andrew Nguyen and Wu Tsang. Refreshingly short and sweet, the two artists presented clips of their works before discussing the idea of the “unavailable image”—something that Tsang had explored in her work We Hold Where Study (2017). Both the artists’ works seek to reconcile a representation of realities, whether in blackness and queerness, or in diaspora identities, through surreal, fantastical imagery. 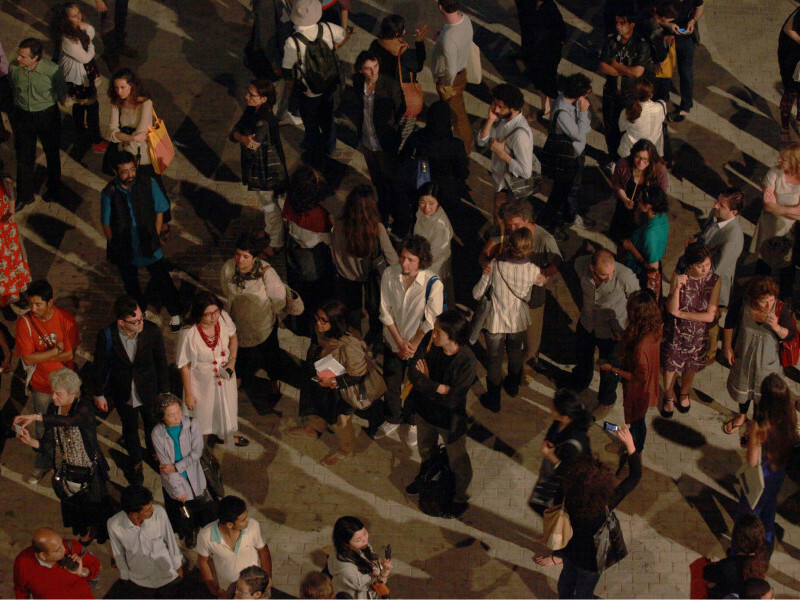 As if sensing that the audience in the room were all in varying states of consciousness—due to exhaustion or jet-lag, with guests flying in from places such as the United States or Shanghai—Mario Santanilla presented Vertigo of a Sunset (2018), a video-audio performance that explores circadian rhythms and the displacement of time through manipulated light and color. As we listened to a stream of thoughts on this theme—with subjects ranging from the life of a fruitfly to the gamut of artificial light colors onboard an Emirates airlines flight—a screen showed pleasant, varying hues of orange, pink, red and white before concluding with an epileptic, jarring sequence, meant to disorient the body and mind. “You Send Me,” the final panel of the day, was unfortunately the least engaging. With the intent of creating stimulating conversation around futurist socities and the warping of spatio-temporal order, the moderator, Ayesha Hameed, began by discussing her own work, Black Atlantis (2016). She explained the fictional world depicted in the film, which is centered around an underwater city built by a generation of hybrid amphibian-babies, born underwater after their mothers, African slaves en route to America, had been thrown off the ships. As a starting point, it was interesting yet far too long, sucking up time that was already running out. The artists that spoke in succesion after—Monira al-Qadiri, Almagul Menlibayeva, Larissa Sansour and Martine Syms—each explained their practices, which individually had merit, but their connections were tenuous and lacked interaction. More like a portfolio presentation, the final panel felt lackluster, especially given the opener earlier that day. Later in the evening, there was a performance of Neo Muyanga’s Songs of Light and Weight (2018), the result of a week-long workshop with singers from the region. Having spent most of my mental energy absorbing the day’s events, and my physical energy adjusting to the intensity of the schedule as well as acclimatizing to the increasingly frigid environment of the air-conditioned site of the symposium, I unfortunately could not attend this last act. I schlepped back to the hotel and digested the themes, topics and takeaways of the past eight hours, before sleep finally took hold.